Last night's search at the hardware store (because one must always check the plants, no?) netted hellebore 'Ivory Prince' among the still sparsely filled plant benches. Hellebores are beauties. They were becoming very popular here in the US as I was just beginning to garden. That begins to feel like an unconscionably long time ago, but I find that most of my early garden loves remain firmly in place, with the exception of a flirtation with nearly black flowers. A few too many were either downright funereal or else were simply red. But back to the hellebores. They are, in fact, one group of plants that I would probably have tried eventually even in the desert, no matter how forlorn the hope of success, so it should be no surprise that they are high on my priority list as I begin a new garden in a much more suitable climate. Even at that, I remember finding mine more drought-tolerant than I expected, with the caveat that drought-tolerance in Missouri is an entirely different thing than in Arizona! More than ever, I find my preference lies with the simpler forms, and so it was easy to decide to purchase 'Ivory Prince', with its single flowers and soft, creamy green coloring. I floated it in my handthrown stoneware dish, whose soft blue-green glaze seemed right for the dreamy flower colors. I'm afraid I cut the blossom too soon, hence the collapsed stamens? Many of you will know more than I about cutting hellebores. I always used to leave all my flowers in the garden. In a Vase on Monday has cured me of that! Thanks to Cathy at Rambling in the Garden for encouraging so many of us to bring a touch of the garden indoors at least once a week! Of course, you had to check the hardware store's plant shelves! I hope 'Ivory Prince' does well in your new garden. I've developed an affection for hellebores too, although they're not stellar performers in my part of the country. However, after a few years in the ground, I always seem to get at least a handful of flowers from them. 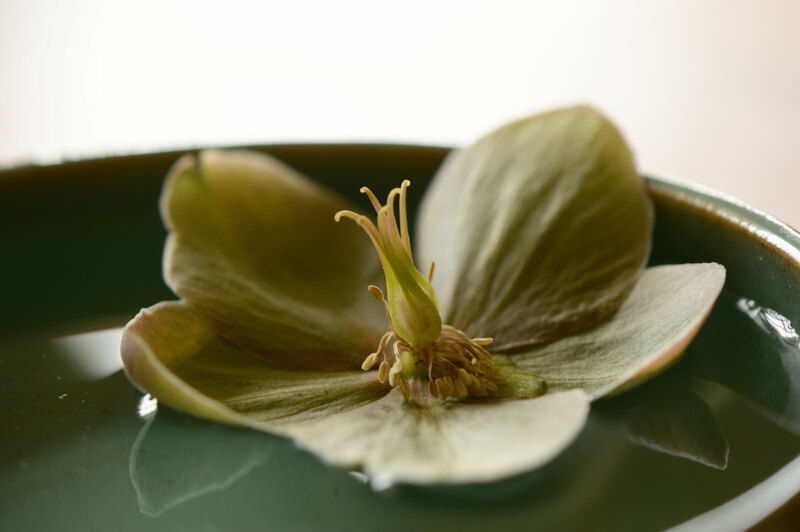 When I saw your photo I literally gasped - I have a similar bowl with a single similar hellebore floating in it, that I didn't include in my Monday vase post this week! I am so glad you will have more choice in planting now but I suppose there will be other challenges as there always are. My new garden is extremely exposed to wind and sun... and cold in winter, and very dry. Hellebores in my old garden in the very dry rockery always seemed happy so I am optimistic. I have planted a few more and will have to post about them all soon! Have a great week Amy! I never knew about Hellebores until we moved here, to North Carolina! I inherited a few with the house but have since bought more. I love them. I think it is so true about our early garden loves: interesting. I come back to some of them again and again. Viburnum carlessi is one I cannot live without. Oh, and black flowers reminds me: have you ever tried Scabiosa Black Knight? One of my all time favorites. Very difficult to grow from seed so I splurge and order plants from Annies. Take a look! 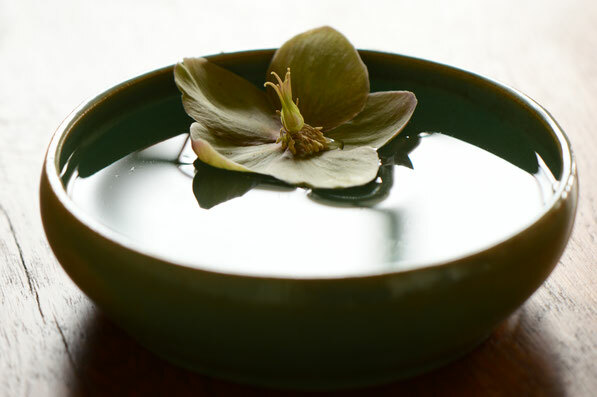 Floating hellebores are pretty, but your bowl is beautiful! Kris - I've been promising myself a trip to my former favorite nursery here but haven't made the longish drive yet, besides being informed it has since changed hands. So even the hardware store was definitely going to be a plant-shopping destination! I did try a hellebore in a container during my first summer in Arizona, but I didn't yet know much about growing things there, so I don't think it counted... ;-) I'm glad to know they grow well for you. As they originate in the Mediterranean, perhaps I don't give them credit for as wide a potential range as they really have! Cathy@Words and Herbs - Great minds thing alike! ;-) I am wondering just how much I have to learn here in the new place as even the wild plants are coming in differently. Besides, we are now up on a hillside - south-facing, which is wonderful - but as in your garden, there is plenty of wind. There also seems to be a great deal of groundwater, even possibly a spring lower down. So I am mystified as to how much water will be available naturally for the plants. Live and learn, I suppose! Libby - Those early loves do so much to color our later gardening! Scabious 'Black Knight' is one I haven't grown - perhaps it is time to try it?! ;-) My favorite very dark flower was the deep red Clematis 'Niobe', with its bright golden center and sumptuous black-red blooms. Diana - Thank you so much! :) Oddly enough, I used to not cut my garden flowers, but I also used to not use my own pottery. I find it much better to go ahead and use both now! I had been searching for an ivory hellebore after seeing one on Susie's blog (I think) but couldn't find one here - till I was searchng for something else and found some which were classed as pale yellow, very ivory-like, but out of stock now! 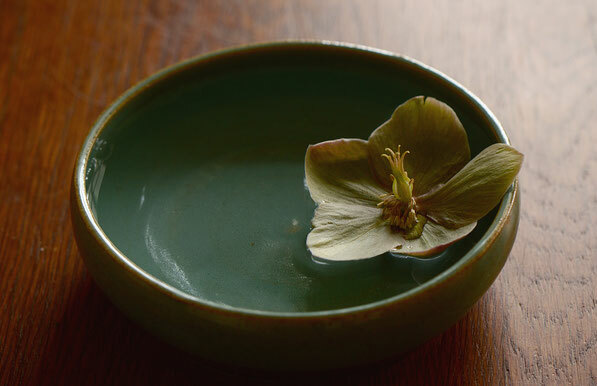 Your single hellebore looks so stylish in the glazed dish - and isn't it strange how IAVOM has changed all these habits of ours! !